Unfortunately, bicycle accidents involving a car or truck are common in the Pacific Northwest. The cause is often driver inattention and/or the driver’s failure to accord the bicyclists their legal right of way. These types of accidents often involve serious injury or death. 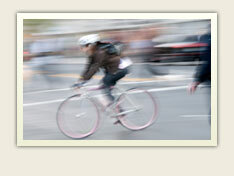 Paul Krueger Law firm diligently represents bicyclists. We know that jurists with anti-bicyclist biases are common and can reduce the chance of getting a fair trial. As such, if the case goes to trial, we pay extraordinary attention to jury selection and exhaustively fight for our client’s right.